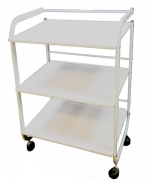 This classic white trolley cart with towel holder, durable, and yet its clean lines will complement any salon dÃ©cor. 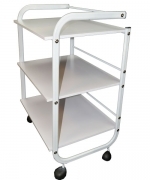 Easy-rolling caster wheels and handles on either side of the cart make it easy to move and store. Very easy to clean surfaces. Easy-rolling wheels to transport trolley to different locations in salon.